With apple blossoms in the orchards and steady flow in the creeks, spring is a superb time for young learners to get outside to observe, explore and grow! 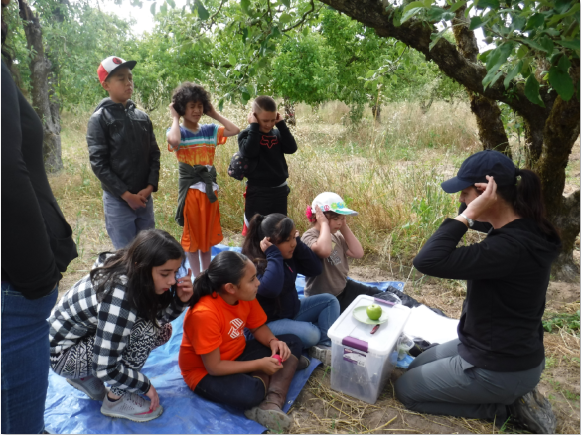 Dutton Ranch of Sebastopol and Gilardi Ranch of Bodega hosted local 3rd, 4th and 5th graders to learn first-hand what agriculture and wildlife have in common and how they can work together. 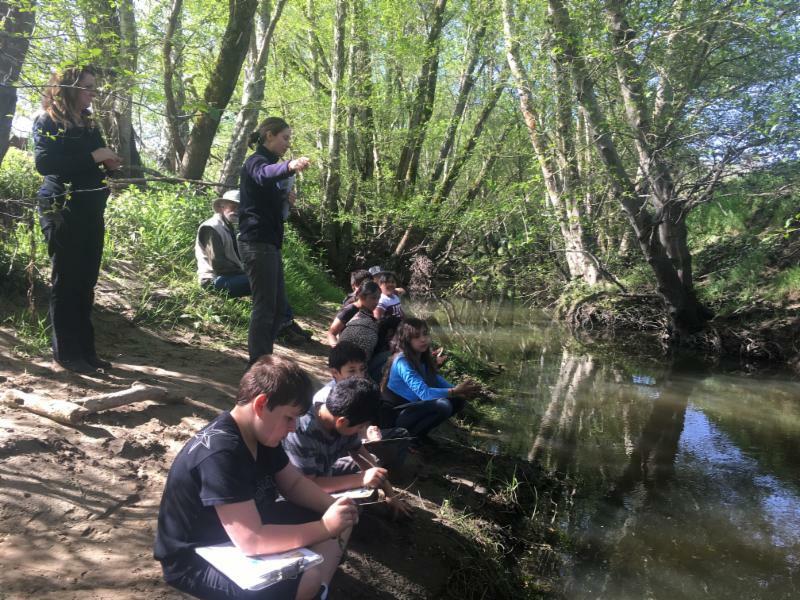 The Teaching Environmental and Agricultural Memories, or the TEAM, program of the Sonoma County Ag Preservation and Open Space District has been leading young naturalists out on conservation easement-held agricultural properties for over seven years now. This award-winning program is a delight to students, teachers and the RCD staff who run the program. Learn more. And, the RCD brought outdoor education into the barn for the Sonoma County Farm Bureau Ag Days event on March 14 & 15. 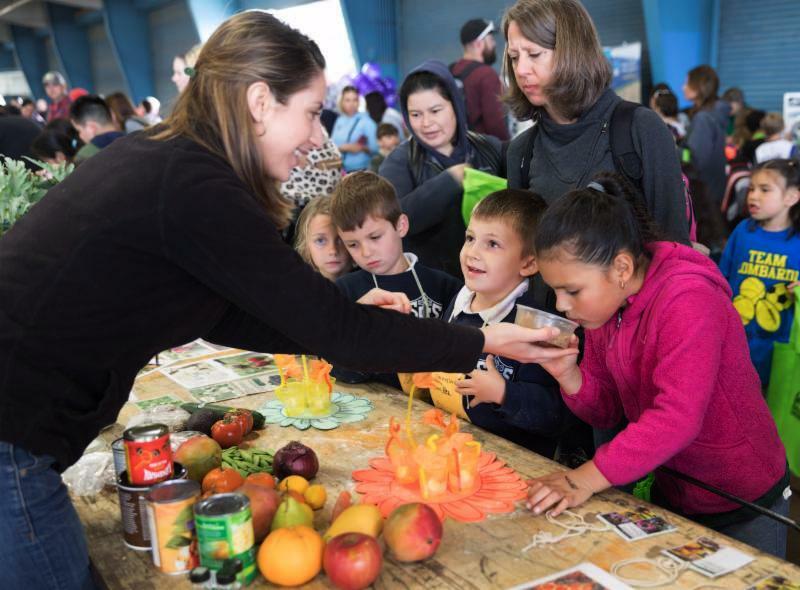 We brought in a display of fruits, vegetables, nuts and beans and asked students, “Do you know what all these foods have in common?” The answer: bees! Students learned how native bees and European honey bees both need our support to do the work of pollination on our farms. 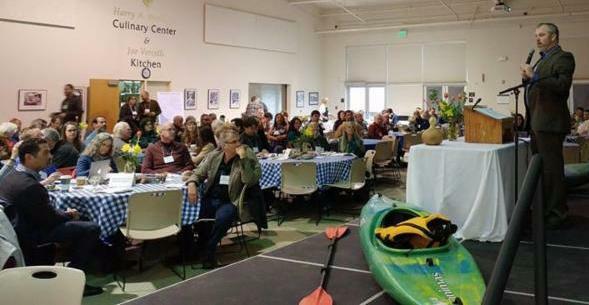 On March 24th, the Russian River community and stakeholders gathered at Shone Farm in Forestville to discuss, celebrate and create a vision for the watershed worth working towards. Residents, artists, non-profits, conservationists, students, vintners, educators, the regional RCDs, Sonoma County Water Agency, Russian Riverkeeper, Dry Creek Rancheria, Pepperwood Preserve, and many, many more came to tell stories that matter and identify actions to promote a holistic, 'beyond sustainability' approach to the watershed that ensures its resiliency and renewal. 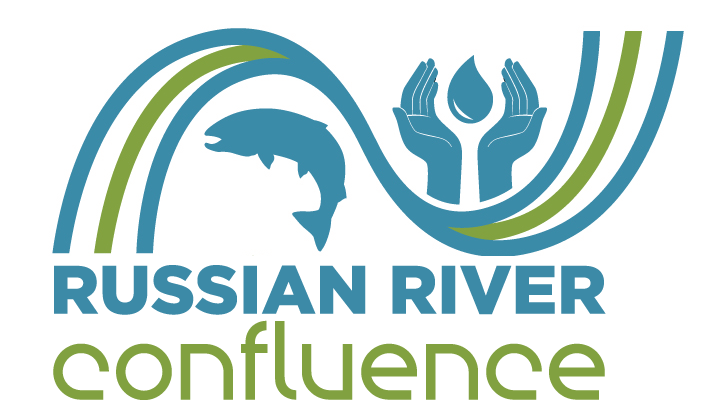 The Russian River Confluence video debuted at the event. Watch it here. 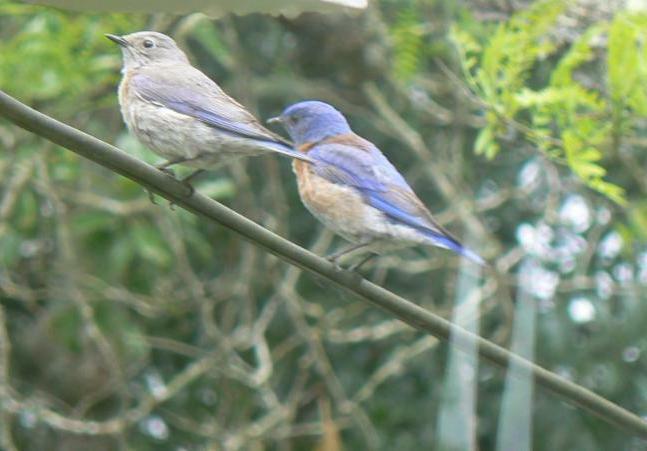 The Confluence promises to lay a plan for the future of the watershed. Stay tuned for updates and ways to get involved! At its April 20th meeting, the Gold Ridge RCD Board decided to sign on to the GSA as a voting member, discussed the best ways to hear public input regarding the GSA, as well as discussed fundraising opportunities to support the RCD's participation for the first two years ($55,000 for the first year and $64,000 for the second year). The RCD will hold a public listening session at its office at 5:40pm on May 18 after the monthly Board meeting. Attend the listening session or send an email to brittany@goldridgercd.org to share ideas or input. On March 15, the Gold Ridge Resource Conservation District board voted to join the group of local agencies participating in the formation of the Santa Rosa Plain Groundwater Sustainability Agency (GSA). A public meeting was held on April 3 to present on the Santa Rosa Plain SGA structure and authority. Agenda and presentation files from the meeting can be viewed here. The first Board Meeting of the Santa Rosa Plain GSA will be finalized by June 1, 2017, and over the next five years the agency will develop a Groundwater Sustainability Plan for the basin. The ultimate goal is sustainable management of groundwater over the long-term by an authority comprised of local agencies engaged with their community. Find out if you are in an effected groundwater basin with the interactive map. Sign up to receive news from Sonoma County Groundwater. Thank you to the Social Advocates for Youth (SAY) YouthLink Employment and Education Services for your partnership, dedication, and can-do attitude at the Salmon Creek Dairy Water Conservation Project site! Mike Zigler from SAY led a crew on an assignment to remove a defective pond cover from the 1.4-million-gallon conservation pond at the Westview Jersey’s Dairy in Bodega. Many thanks to the Sonoma County Human Services Department Employment and Training Division through the Workforce Investment Act and the Sonoma County Youth Ecology Corps for making the SAY program possible! 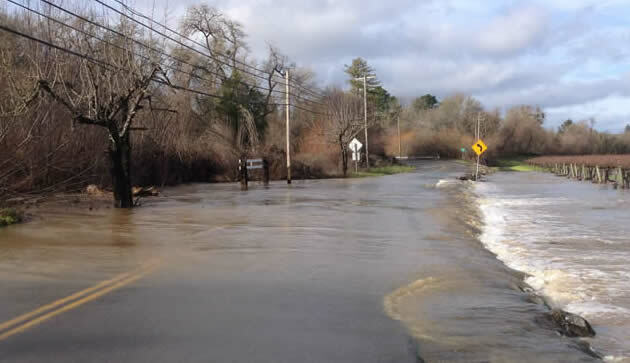 The emergency project on Green Valley Creek at Green Valley Road in north Sebastopol, designed to expand the flow capacity of the creek and reduce the frequency and duration of events where the stream floods over the road, is now underway. Want to keep track of the repairs and status of the Green Valley Road Project? Keep an eye on our project page, or request to receive email updates by contacting Sierra Cantor at Sierra@goldridgercd.org. May 3 Solutions Beneath Our Feet: Can Regenerative Agriculture & Healthy Soils Help Combat Climate Change? May 4 Eat at Santa Rosa or Ukiah Chipotle Restaurants to Donate 50% your meal to our nonprofit partner, the North Coast Resource Conservation and Development Council! Just bring this flyer.